I can’t believe I’ve never written about a trip to Poole’s Mill Park – actually I can, because there are LOTS of things I’ve never written about … so much to do, so little time. But we spend a lot of time here so it’s about time I sit down and write a little. If you’ve been then you probably already know all about this little gem. If you haven’t, hopefully you’ll know more after reading this! 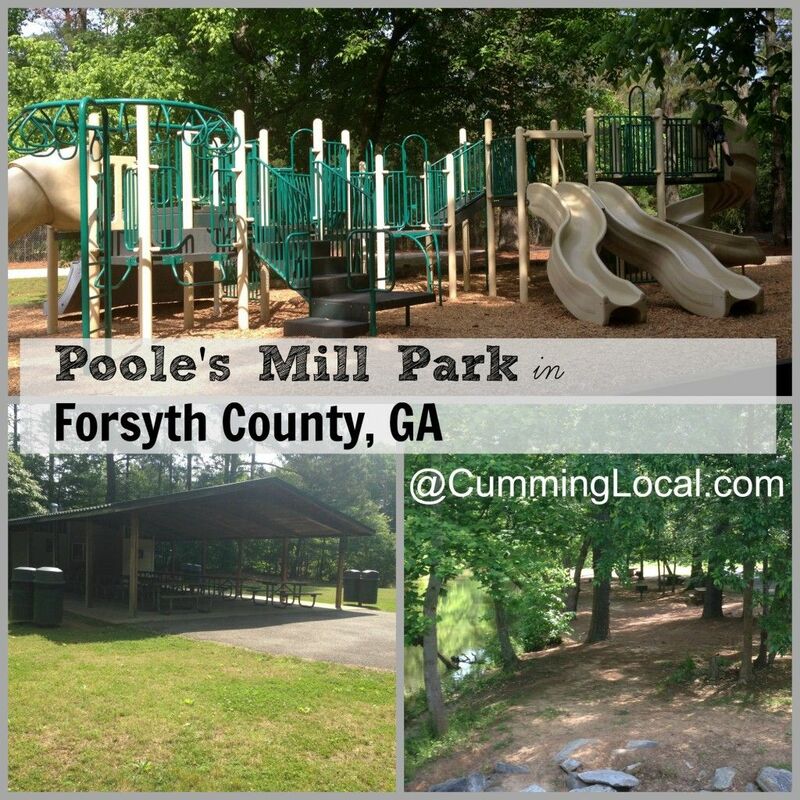 Poole’s Mill Park is located in the far west part of Forsyth County – it actually has a Ball Ground address – 7725 Pooles Mill Road, Ball Ground GA 30107. It’s probably most famous for its old covered bridge – so much history (and tacky graffiti, what a shame). It’s an incredibly popular spot for family photos – my family included. But it’s also a great place to make new memories too. 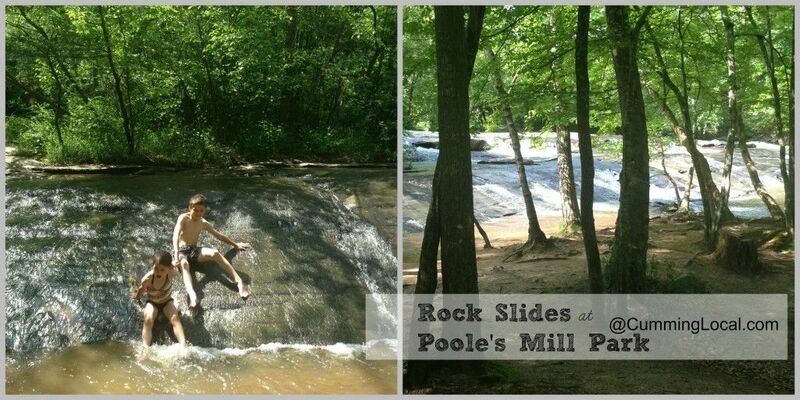 A typical spring or summer visit for our family will include a visit to the playground, a picnic lunch down by the river and an hour or two at the rock slides. If my husband is with us then we’ll tack on an extra hour for fishing at the river. The following “Pros, Cons & Tips” are strictly from my (Mandi) perspective. They may look different for your family but hopefully, if you’ve never been before, it will help you with some of your planning. Pavilion available to reserve or use if not already reserved (note: It gets crowded though, so if you want it make sure to reserve through Forsyth County Parks & Rec). Playground is great for elementary age children and there is also a smaller slide and swings for the little ones too. The bathroom isn’t convenient unless you’re spending all your time at the pavilion. I always make sure the kids use the bathroom before we go to the park itself and then again before we go down to the river or rock slides. While there is some good shade throughout the park, there is little to none afternoon shade on the playground itself so just be prepared. Wear old swim suits or ones you don’t mind getting messed up. While the rocks are smooth it’s also a lot of wear & tear on them. Bring a chair or blanket to sit on – there is some great, sandy places to sit if you want to relax while the kids enjoy themselves, but nothing to sit ON. So pack a bag of blankets or carry some folding chairs. 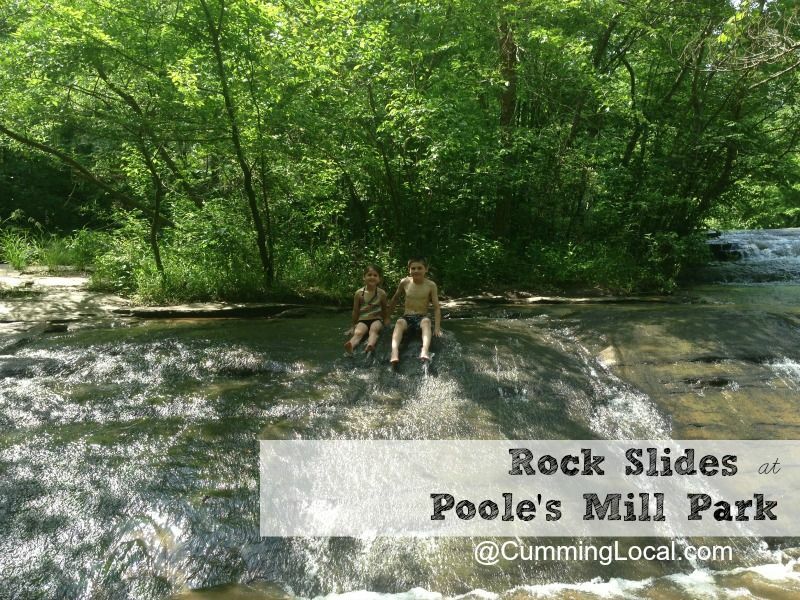 I’ve even seen some families enjoying a picnic at the rock slides – plenty of room to do that if it’s not too crowded. Consider bringing an inflatable tube to lounge in the river. We usually don’t do this, but I see plenty of people that do. Don’t go past the private property signs. Ok, so this is a pet peeve of mine – there are fences & signs clearly marked. I see so many people (sometimes parents with their young kids), walking right past them. If you cross a fence you’re on private property. Whatever you carry in, carry it back out. This is a beautiful area of Forsyth County – people travel just to come enjoy it. Let’s keep it clean. The ugly graffiti and spray painting on the historic covered bridge is so sad to me. And just as sad is all the trash that you might find on the river banks. It’s easy – if you bring it in, bring it out! Enjoy & have fun – this truly is a special gem here in Forsyth County! Want to get family photos taken? Be sure to check with our website sponsor, Cassesse Photography – Terri goes there a lot for mini sessions or as a requested location. I just visited it last night for the first time doing a photo shoot for my clients. It was a last minute request and I will definitely be visiting more often… either for more sessions or to take my girl!